With warm temperatures and an abundance of unstructured free time, summer is often when kids fall off the health wagon, resulting in increased weight gain and risk of obesity. Children actually gain more weight during summer vacation than they do the entire school year, according to a 2014 Harvard University study. Aside from the host of obesity-related health issues, including heart disease, high blood pressure and diabetes, childhood obesity takes an extreme emotional toll. A 2016 study published in the journal Child Development revealed a strong link between obesity and psychosocial issues such as low self-esteem and clinical depression for kids as young as six years old. Children who learn sound, healthy habits at home tend to maintain those habits as they get older. Unfortunately, the opposite is also true. Obesity persists from childhood on. In fact, children who are obese between the ages of 10 and 13 have an 80 percent chance of becoming an obese adult, according to 2014 data from the Center for Disease Control, underscoring the importance of building the framework for a lifetime of healthy living. As kids head back to the classroom this fall, it's the ideal time to get back to healthy habits and even create new ones. Here are five simple steps to do so and get your family physically and emotionally ready for heading back to school. For me, Sundays are for long leisurely family breakfasts, shopping and batch cooking. Portioning out a huge frittata, salads for lunches, salsa or pesto, a vinaigrette and veggie sticks in Tupperware or baggies makes for easy and healthy grab-and-go meals and snacks all week long. I love preparing a dinner that easily freezes like chicken tacos, turkey chili or a hearty chicken noodle and veggie soup. These are frozen treasures for my family when I am traveling, sick, exhausted or when my son or daughter brings home a friend for dinner so I don't have to call in a pizza. This bowl of veggies makes an easy, healthy and portable snack for my kids' school lunches. I have also saved time, stress, bread and fixings with my habit of assembling all my sandwiches right after shopping and dropping them into the freezer. 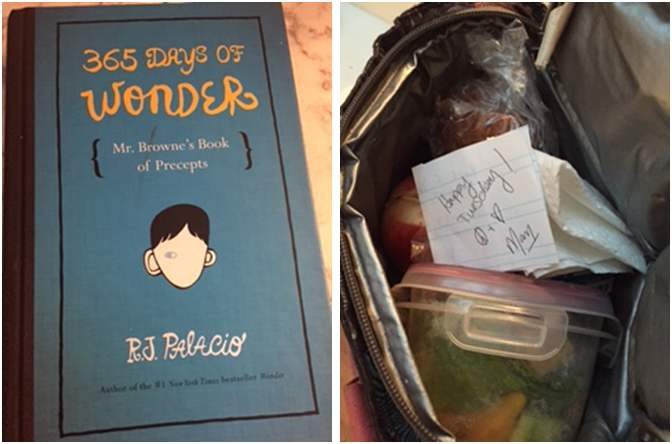 Plus, the sandwich keeps everything else cold in the lunch bag and defrosts by my children's lunchtime. At the grocery store, I look for fresh whole grain bread with seeds or oats from the bakery and steer clear of bread made with hydrogenated oil or high sugar content. Getting my kids involved in prepping, shopping and cooking has really helped promote a "we are family and need to help each other" energy in our household, which has unfortunately not yet translated to the laundry. As a family, we plan five meals for the week; both my son Zack and daughter Julia are responsible for cooking one night a week. I find they are more likely to eat what I make when they feel like they had a role in the decision-making process. They each love to be the one to write the weekly meal calendar and get excited when they know what to expect, especially if it's one of their choices. Beyond playing Exec and Su Chef, my kids also take turns setting the table, picking their favorite plates and napkins and creating place cards. I love watching my kids creating place settings for dinner and embracing the idea of a family meal. For inspiration for interesting, healthy new meals each week, Common Threads, my organization dedicated to fighting the obesity crisis in primarily underserved communities throughout the U.S., recently published a handbook that details an eight-week, budget-friendly meal plan for a family of four. It's a great resource and also includes a produce guide and interactive programs designed to get kids interested in eating fruits and vegetables. I also scour Food52.com for one-pan dinners and Food and Wine's Best Healthy Recipes Ever section for ideas to run by the family! Preparing and eating dinner as a family allows me to keep an open dialogue with my children. The kitchen is the perfect place to get the skinny on who they sat next to at lunch, the funniest thing that happened that day or hear about a nice interaction they had with a friend. We try to make sure there is always at least one parent eating dinner with the kiddos, so one of us can hear their highlights of the day. "I hold family dinner time as sacred, even if I have to adjust the time I sit down to accommodate sports or other after-school activities. I still believe this is the main way to keep the emotional connection in a family. And since I have boys, I get to hear all sorts of stories they likely wouldn't just share with me, like which girls they like," said Felicia Shallow Davis, mother of five, trained chef and Executive Director of the Public Building Commission in Chicago. Case in point, a 2012 study by Cornell University's College of Human Ecology found that families who eat meals together three or more times per week experience the most positive outcomes for their children, including lower obesity levels, and are linked to lower levels of depression in children. My girlfriend Christina would say that a meal is not really complete without a sweet bite of something. Fresh fruit and healthy desserts such as this mango crisp crumble can keep my kids at the table longer which means I get to hear more about their school day, what's on their minds or the bus drama! Desserts like this healthy (and yummy) mango crisp crumble keep my kids at the dinner table a little longer so I can hear more stories about their days at school! The dinner table is also a great place for us to hold important conversations about what is going on in the world. My kids hear so much from their friends or on TV about current events, but don't always know how to put things in the proper context. I like to have the opportunity to sit down with them if they have questions so they can create their own well-informed opinions about the world around them. Yes, it's still the most important meal of the day! Starting the day with a healthy, relaxed breakfast can set a positive tone for the morning and provide the brainpower and emotional calm needed for a successful day in school. A 2013 study by the University of Leeds found that habitually eating breakfast had a positive effect on on-task behavior in the classroom, indicating that students were better able to concentrate and pay attention during school. Breakfast also provides the opportunity to get a head start on meeting daily nutrition recommendations with several vitamins and minerals that can be difficult to make up later on for those who skip the meal altogether. Oatmeal with fruit, protein and nutrient-packed smoothies, and fruit with non-fat Greek yogurt with drizzled honey, chia and seeds are no-drama favorites in my house. After-school can also be a hectic time with activities, homework, dinner prep and getting ready for the next day. Once everyone adjusts to their schedules, we try to set daily routines and stick to them. That goes for everything from when we brush our teeth and take a shower to when we eat our meals. The goal is to set expectations for the kids and get them to a point where they can develop and stick to their own healthy and happy routines. "Back in the day, we posted a large calendar in the kitchen so everyone could see it," said Davis. "Each member of the family had a color to keep all of our personal and professional schedules in one place." When looking at the day ahead, we'll start preparing the night before. My kids get their backpacks ready and lay out clothes for the next day. My hope is that this gives them a sense of accomplishment before going to bed and less on the to-do list the next morning. For me, evening prep leads to a more relaxed morning and provides a valuable lesson in time management. "I need to get three kids fed and out the door in the morning come school time, so a little planning goes a long way," said Frances Largeman-Roth, nutrition expert and author of Eating in Color. "This is especially helpful the first week of school when the kids haven't gotten the hang of the schedule yet. And I get up earlier than usual -- extra time helps me stay sane!" A good night's sleep for everyone is integral to helping families stick to schedules and form healthy patterns. Research from the University of California in 2012 revealed that lack of sleep fuels eating junk food because the brain is more likely to give in to impulses and cravings. Plus, continuing to not get enough sleep has some serious long-term consequences. It can lead to chronic health problems like high blood pressure, heart disease and stroke, according to Harvard Medical School. According to the National Sleep Foundation, children ages six-13 need between nine and 11 hours of sleep, teenagers need between eight and 10 and adults require between seven and nine. If your child has trouble sleeping, try a regular routine of warm baths, reading time and soft music as background noise before bedtime. My son loves the wind chimes and ocean breeze sounds and he falls asleep almost immediately while my daughter prefers 80s pop, which is what might be keeping her up. One of my board members, a total health nut, turns on classical music for her daughter in the evening as she falls asleep and again in the morning to get her up. We all have those terrible chaotic mornings that can be unsettling at times. On those mornings, I remind my kids that they need to be able to put whatever happened at home on pause so they can be 100 percent focused on learning and achieving in the classroom the moment they walk into school and mention that together we can find a solution to what went wrong later. This is where affirmations come in handy in my house. We read a quote from the 365 Days of Wonder each morning and throw on some good tunes to keep things as breezy as possible. I love trying to dish out as many deserving compliments as possible to my children. I also include motivational quotes in my kiddos' lunches in the hope that they provide a little love, light and positive energy. 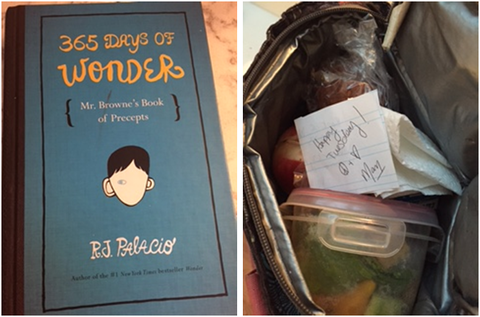 Optimistic quotes from the book 365 Days of Wonder and affirmative notes in school lunches are two ways I try to keep my kids thinking positive! "If they've had a tough day or just every now and then, ask your child to rate how they are feeling about school on a 1-10 scale, with one being lousy and 10 being fab," said Mindy Mackenzie, a former therapist and HR professional for top-level executives at multiple Fortune 500 companies. "Then ask why that number. Finally, after listening to them, ask how you can help move the number closer to a 10. Then listen some more. If you can support them in a way that is beneficial for them, without being a helicopter parent, do it. Most of the time, the conversation in and of itself is sufficient. Do this periodically to stay in tune with your child and how they are navigating their world." They may not open up right away, so I try to stay approachable and ready to talk, even if it is past their bedtime. I tell my kids that they can say anything and I won't be judgmental, and I just listen until they ask for feedback. Every night when my own mother (who is a guidance counselor) would put me to bed, she would tell me she was proud of me, that tomorrow was going to be another great day and a chance to learn something new or accomplish a goal. It stuck, and I whisper the same thing to my own babes. After-school programs can be critical in supplementing academic enrichment. There is a treasure chest full of life lessons embedded in activities like sports, art, music, academic clubs and a variety of other activities. Kids learn in different ways what it means to feel safe enough to relax, breathe, blow off steam and make new friends that share common interests. While many districts offer these programs within their schools, national organizations such as Afterschool Alliance expand opportunities for low-income youth by providing access to educational and recreational after-school programs. Local community centers also have a wide range of free programs for kids to explore new interests in a safe environment. I am a huge believer in extending learning beyond the classroom and believe after-school activities can play an important role in building up a child's strengths. I have seen it with both of my own children as well as in our kitchens and classrooms at Common Threads. After-school programs help children develop positive relationships with their peers and adults. They also provide another safe place to practice a host of values and ethics (respect, honesty, responsibility, restraint, kindness and cooperation) while pursuing their passions. The start of the school year brings many challenges for every family: getting used to unfamiliar teachers, making friends with different classmates, adjusting to new schedules. But every fall gives us an opportunity to start fresh with a better approach to learning good habits, and the chance to put intentional effort and practice into how we live each day. Wishing you all a killer year at school and at home!